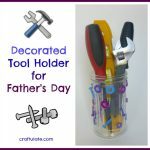 This Father’s Day tool craft will be a great gift for my son to give to his Daddy. A few months ago we moved to a new house and my husband is LOVING his new workshop. My son and I decided to make a tool-themed craft to give him for Father’s Day. I started by finding some tool templates online (my freehand drawing is SO bad!!). I did my usual and scoured Clker, finding outlines of a saw, wrench, hammer, chisel, pliers and screwdriver. I resized them then printed them onto paper. I cut round the outlines out, copied them onto cardboard, then cut out the shapes. Older kids could help with this stage but my four-year-old’s cutting skills aren’t up to this! In fact I made the saw from really thick cardboard and had to use a craft knife – definitely a job for adults. The other tools were on thinner card so I could cut those out with scissors. Then I used a craft knife to cut a hole in each one, and then five holes in the saw. Then it was time to get my son involved and start painting the handles of the saw, hammer, chisel, pliers and screwdriver. No need to paint the wrench. I applied a second coat to each one to make the colour more solid, and once the paint had dried I brushed on a coat of Mod Podge to give the handles of the tools a more finished look. At each stage I used a toothpick to make sure the holes were free from paint and varnish. When that had dried we started wrapping the metal parts of the tools in kitchen foil. This was actually rather tricky so unfortunately F gave up quite quickly. It did look great though! Kid-friendly silver metallic paint might be an easier option for younger kids. F chose some stickers to spell “Daddy” across the metallic part of the saw, and then it was time to string it all together. I used some friendship thread to tie each of the smaller tools to the saw so that they all hung down below it. Ta-da! With hindsight I think I was a little overambitious as to how much of this craft F could participate in. But I consider it a joint effort and that’s fine by me! Inspired by this image seen on Pinterest, sadly now a dead link. If you can direct me to the original post please let me know! Follow my Father’s Day board on Pinterest for more great ideas! 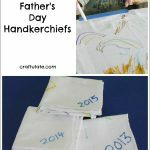 Follow Craftulate’s board Father’s Day Crafts and Gifts on Pinterest. This would look awesome in our garage – awesome idea! Thanks Emma! I can’t wait for my husband to see it! I love your Father’s Day Craft! I added it to a Father’s Day craft round-up on my blog, Mom Envy. Have a great week! I just searched for them online and made them the size that I wanted. I agree that you need a template or pattern of some kind! Hello, I was wondering if you are open to sharing the template/pattern that you found and used for the mobile? I would truly appreciate it. Sorry we made this several years ago and don’t have it any more!